Here are before and after shots of what these containers were used for and what they are now being used for. 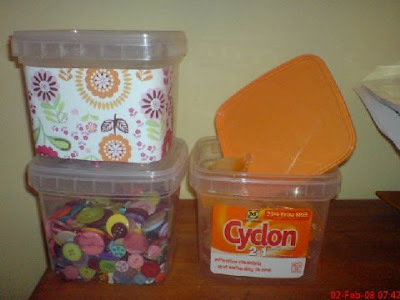 I ALWAYS buy these types of washing capsules as you get these fab containers. All the big stores do them, Morrisons has a funky orange lid, Tescos has a extra big one with a blue lid and Sainsburys is all clear. Simply tear off the labels and fill with pretties. I either cover with paper and I will label up once I am in my shed and I know what I want where, or leave clear to see what is inside. I have primas, buttons, brads, eyelets and more in mine. I currently have 12 of the normal sized ones and they stack up great. You can check her fabulous cards and bits of her life here.